Felipe Feldman, an 8th grader at Easterbrook Discovery Middle School, has been selected to be a part of the SJZ High School All Stars, a regional audition-based jazz band for students interested in the study and performance of jazz. San Jose, November 30, 2018: Felipe Feldman, an 8th grader at Easterbrook Discovery Middle School, has been selected to be a part of the SJZ High School All Stars, a regional audition-based jazz band for students interested in the study and performance of jazz. The only 8th grader on this year’s ensemble, and only the second 8th grader ever to be selected, Felipe is a saxophonist in his third year with Easterbrook Discovery Middle School’s (EDMS) Jazz Band. The High School All Stars include a large ensemble and a combo, designed to help students achieve a mastery of improvisational techniques, while advancing their knowledge of music theory, arranging, composition, performance, and jazz history. Selected musicians from both private and public high schools throughout the region take part in weekly rehearsals at San Jose State University and performances in professional venues. Former EDMS Jazz Band member, Timothy Youngman, a student at Prospect High School, is also a member of this prestigious group. 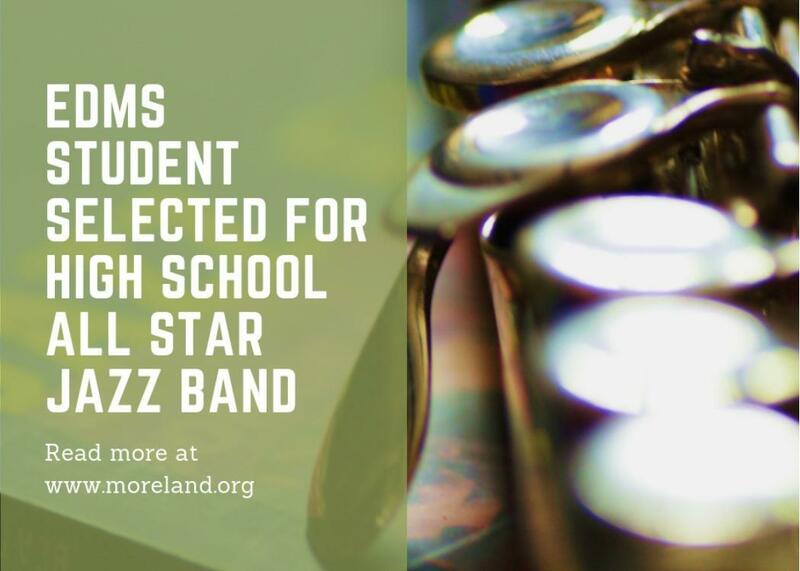 Thanks to the exemplary talents of Moreland students and teachers, Moreland has received numerous music awards and honors while competing in festivals and concerts throughout the state. Moreland is incredibly fortunate to have such talented teacher leadership with Greg Bergantz, Nils Johnson, Rebecca Ayer, Barbara Wong, and Emily Chiet. Music in Moreland (MiM) supports the music program within the Moreland School District, including the funding of new instruments each year, so that students have the opportunity to play instruments that they may not be able to afford. MiM consists of parents and community members dedicated to sustaining Moreland’s award-winning music program for all Moreland music students. Moreland’s music students will be performing in upcoming District concerts in December and January. Check https://www.moreland.org/apps/events/ for upcoming dates.